Dans la maladie de Gaucher, l’enzymothérapie substitutive a prouvé son efficacité sur les manifestations systémiques mais la taille de l’enzyme de supplémentation ne lui permet pas de traverser la barrière hémato-encéphalique et de traiter l’atteinte du système nerveux central. Pendant de nombreuses années, il a été admis que les anomalies de la séquence des acides aminés de la glucocérébrosidase diminuaient son activité catalytique. Il a été récemment démontré que la baisse de son activité résulte d’une diminution quantitative de l’expression de cette enzyme, ce qui implique l’existence d’un processus spécifique au cours duquel les polypeptides mal repliés sont ciblés par des médiateurs de l’homéostasie protéique pour être dégradés. La modulation de l’action de ces médiateurs pourrait prévenir la dégradation de la glucocérébrosidase et lui rendre sa fonction. Des études récentes ont montré que de petites molécules inhibitrices des histones déacétylases (qui peuvent traverser la barrière hémato-encéphalique) étaient capables de moduler ces médiateurs dans des cellules provenant de patients présentant une maladie de Gaucher et d’augmenter la quantité et l’activité de la glucocérébrosidase. 1 Scientist Emeritus, National Institutes of Health, Building 10 Room 3D03, Bethesda, MD 20892-1260, USA. 2 Surgical Neurology Branch, National Institutes of Health, Building 10 Room 7N246, Bethesda, MD 20892-1414, USA. The extraordinary benefit of enzyme replacement therapy (ERT) on the systemic manifestations of Gaucher disease was demonstrated in 1991. Since that time, investigators have devoted substantial effort to improve the delivery of enzymes to the brain because many hereditary metabolic disorders are characterized by extensive central nervous system involvement. Because the required supplemental enzyme is too large to cross the blood-brain barrier (BBB), ERT for central nervous system involvement was out of the question at that time. Several innovative strategies that have been reported to overcome this impediment are discussed. Recent investigations have provided additional insight concerning the pathogenesis of enzyme deficiency disorders. For many years it was presumed that alterations of the amino acid sequence of enzymes such as glucocerebrosidase reduced the catalytic activity of the enzyme. It has recently been shown that the decrease of glucocerebrosidase activity was the result of a quantitative loss of the amount of this enzyme. Significant increases of its activity were obtained with small molecule inhibitors of histone deacetylase that cross the BBB. The effect of such materials on neuronopathic Gaucher disease and other CNS metabolic disorders is discussed. Presented at the “Brains for Brain Meeting”, Frankfurt, Germany, 9-11 March 2012. Enzyme replacement therapy (ERT) for hereditary metabolic disorders was proposed (Brady 1966) shortly after the discovery that the enzymatic defect in Gaucher disease was insufficient activity of glucocerebrosidase (acid beta-glucosidase EC 3.2.1.45) (Brady et al 1965). Extraordinarily beneficial effects of ERT were demonstrated with regard to the systemic manifestations of this disorder that included reduction of hepatosplenomegaly, improvement of the damaged skeleton and reversal of the anemia and thrombocytopenia in patients with non-neuronopathic (type 1) Gaucher disease OMIM 230800 (Barton et al 1991) (Grabowski et al 1995). However, ERT showed little or no benefit of the central nervous system (CNS) involvement in patients with type 3 neuronopathic Gaucher disease (OMIM 23100) (Schiffmann et al 1997), an observation that has been repeatedly confirmed. Glucocerebrosidase (GBA) is comprised of 497 amino acids to which four short oligosaccharide side chains are linked. This glycoprotein is too large to cross the blood-brain barrier (BBB). Hence, ERT for approximately 5 % of patients with Gaucher disease that have CNS involvement was out of the question at that moment. Early investigations to overcome this limitation centered on the possibility of opening the blood-brain barrier for a short period of time to allow unmodified glucocerebrosidase to enter the CNS (Barranger et al 1979). However, the narrow window of effectiveness of this procedure and the possibility of irreversible alteration of the BBB prevented clinical application of approach to deliver enzymes to the brain. It was therefore of interest to determine if conventional procedures for the intravenous administration of exogenous enzyme could be modified so that ERT became effective for patients with CNS involvement. Several innovative strategies have been reported to attempt to overcome this impediment. Multiple high doses of enzyme appeared to exert a beneficial effect on the CNS damage in a murine model of mucopolysaccharidosis VII (Vogler et al 2005). Sly and his associates also reported that inactivation of carbohydrate-dependent receptor-mediated uptake of glucuronidase treated with sodium meta-periodate followed by reduction with sodium borohydride resulted in more efficient clearing of mucopolysaccharides in the brain of these mice than animals treated with unmodified glucuronidase (Grubb et al 2008). Pardridge and coworkers developed a molecular Trojan horse technology by fusing a monoclonal antibody to the human insulin receptor to an enzyme that improved its delivery to the brain (Pardridge 2010). Furthermore, intrathecal and intracerebroventricular administration of enzyme may help in certain cases (Ziegler et al 2011). Another innovation that may prove useful is the attachment of the protein transduction domain of HIV-1 Tat protein to an enzyme as exemplified by the increased transport of erythropoietin across the BBB when linked to TAT (Zhang et al 2010). Although these and other approaches continue to be under investigation, there has been no consistently beneficial report that such technologies improved the pathological alterations in the brain patients with lysosomal storage disorders with CNS involvement. Because of this limitation, an investigation of potential additional therapeutic strategies was deemed to be essential. Recent investigations have provided critical insight concerning the pathogenesis of enzyme deficiency disorders. For many years it was presumed that alterations of the amino acid sequence of GBA such as the change of arginine to serine at amino acid position 370, the most prevalent mutation in patients with type 1 Gaucher disease and the substitution of proline for leucine at amino acid position 444, the most common mutation resulting in CNS pathology in patients with types 2 and 3 Gaucher disease, reduced the catalytic activity of GBA. We along with our collaborators have demonstrated that the decrease of GBA activity was the result of a quantitative loss of the amount of the enzyme in cultured skin fibroblasts derived from patients with these mutations (Lu et al 2010). The reduction of the amount of GBA appears to be caused by reduced binding of the enzyme to the TCP1 ring complex (TRiC), a regulator of protein folding. In addition, there is increased interaction between GBA and c-Cbl, an E3 ubiquitin ligase. These simultaneous alterations may underlie the reduction in the quantity and therefore lowered available catalytic activity of GBA in patients with Gaucher disease with these common mutations. This concept is supported by the observation that lactacystin, a proteasome inhibitor, increases GBA activity in cells derived from patients with the N370S and L444P mutations. Whether similar reductions of catalytic activity occur in patients with Gaucher disease with other GBA mutations remains to be determined. The finding that reduction of enzymatic activity in patients with Gaucher disease with N370S and L444P mutations is caused by a decrease in the quantity of GBA expression implicates a specific pathway through which inappropriately folded polypeptides are targeted by protein homeostasis mediators for proteasomal degradation. Modulation of the effect of these mediators may prevent GBA degradation and restore is function. Histone deacetylase inhibitors are a class of proteostasis regulators that have been reported to correct aberrant prtotein folding in type 2 diabetes (Ozcan et al 2006); cystic fibrosis (Hutt et al 2010) and in fibroblasts derived from patients with type C Niemann-Pick disease (Pipalia et al 2011; Munkacsi et al 2011). Observations made by several investigators revealed that histone deacetylase inhibitors affect the heat shock gene response and protein folding through modulating heat shock proteins such as HSP90, HSP27 and DNAJ (Bali et al 2005; George et al 2005; Kovacs et al 2005; Hutt et al 2010). These effects result in modulation of: (i) heat shock response-related gene expression; (ii) protein folding and (iii) ubiquitination and proteasomal degradation thereby restoring the function of mis-folded proteins that is a characteristic of mutated enzymes with amino acid substitutions. We recently investigated the effects of histone deacetylase inhibitors (HDACi) in cells derived from patients with Gaucher disease to determine whether HDACi could modulate the protein mediators involved in the degradation of mutant GBA. Significant increases in the quantity and catalytic activity of GBA with the N370S and L444P mutations were shown to occur in the presence of small molecule inhibitors of histone deacetylase (HDAC) such as suberoylanilide hydroxamic acid (SAHA) and the novel HDAC inhibitor LB-205 that cross the BBB (Table 1). The exact mechanism of how HDACi facilitate the increase in catalytically active protein is not clear at the present. HDACi could regulate proteostasis through several possible mechanisms involving various mediators of chaperones, chaperonins and the ubiquitin-proteosomal protease. Our findings indicate that the effects of some of the potential mediators were modulated by HDACi. Both N370S and L444P GBA mutants demonstrated increased binding to Hsp90 and decreased binding to Hsp70 resulting in increased ubiquitination and degradation. Treatment of cells with SAHA and LB-205 reduced ubiquitination of N370S and L444P GBA mutants compared with non-mutated GBA by decreasing their binding to Hsp90 and increasing their binding to Hsp70 and TCP1 ring complex (Fig. 1). These findings indicate a potent therapeutic potential of HDACi for the treatment of patients with Gaucher disease. The in vivo effect of these materials on neuronopathic Gaucher disease and other hereditary metabolic disorders involving the CNS is under investigation. 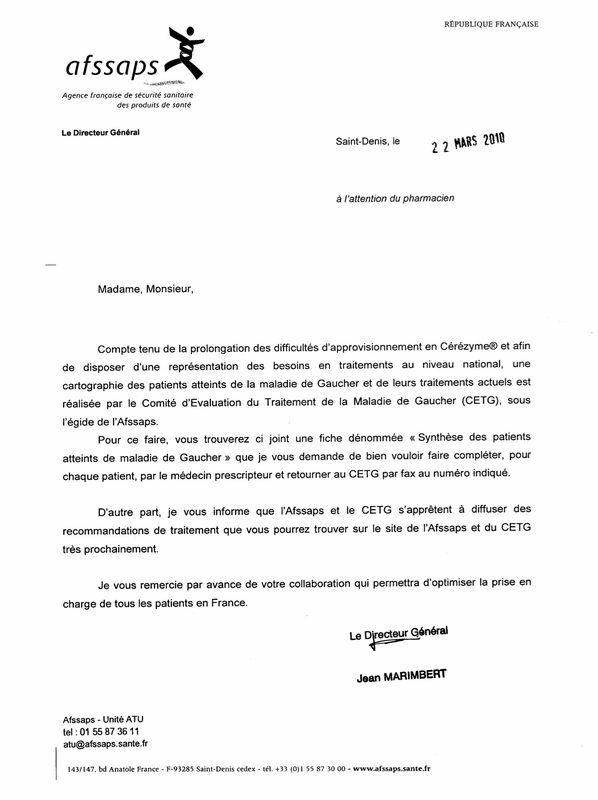 Shire obtient un statut rapide pour le traitement de la maladie de gaucher.